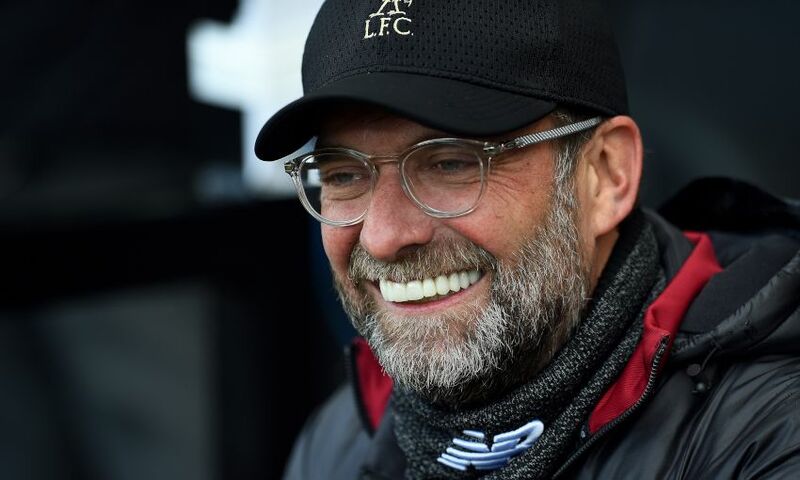 Jürgen Klopp described Liverpool’s 2-1 victory over Fulham as ‘an average game, a sensational result’ after his side returned to the summit of the Premier League. 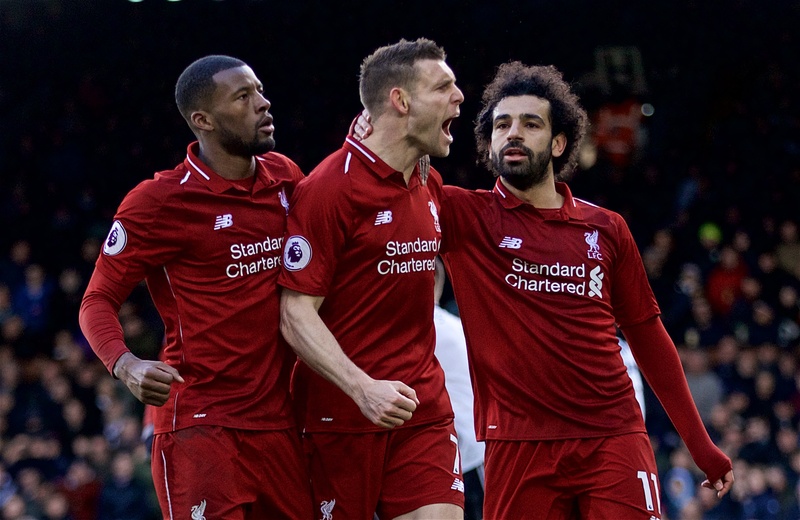 James Milner kept his nerve to strike home a penalty with nine minutes of normal time remaining at Craven Cottage to ensure the Reds moved back to the top of the table, two points clear of Manchester City having played a game more. The Reds had opened the scoring midway through the first half as Sadio Mane slammed in his 20th goal of the season; however, Ryan Babel levelled on 74 minutes when he netted against his former club following misjudgement between Virgil van Dijk and Alisson Becker. We started better and then we lost the rhythm a little bit because of two things. Fulham are a really good football-playing side; I saw the last two games, and over the season I saw a few more, but I had to watch the last two games more intensely. They are a really good football-playing team, in the moment without getting really dangerous in front of goal. It means they play around and we have to run a lot, in a week where you played on Wednesday. For us, it would be easier if we’d had more chances to win the ball; you cannot win the ball because they just play around, you have to only close the gaps until they make a mistake or you win the ball one time. It’s a strange one, it’s so different to the two games we played in the week, Burnley, Munich and now Fulham. They were three nearly different kind of sports. That cost us a bit of rhythm. We scored a wonderful goal and we could have had more of these situations, we were still dominant. But when they had the ball we had to work a lot. Second half, I thought we were a bit clearer in the situation and had better chances in the box, we immediately started better. That’s all OK, it’s a normal game against a good football team. We could have scored one or two more before Fulham. We let them back a bit into the game, with counter-attacks and passing the wrong ball. It’s just the intensity of the competition, it’s nothing to do with nerves. Trent passed the ball into the middle, they get the ball, pass only one time and then Babel is against one or two [defenders]. These situations hurt, but it’s normal. The goal they scored, I thought a little bit we begged for it – there were two or three moments where we asked for it. There were two or three moments not exactly like that but they had their best moments in that period of the game – and then finally they scored. But then I actually saw the reaction of my players and I’m really pleased with that. It was a good reaction. After they got the equaliser, we were again much clearer than we were before the equaliser. So, all good, a good reaction. Not a perfect football game but, in a difficult week for us, a sensational result. Mo scored a lot of goals and then he got the penalties as well, but when Millie is on the pitch I think it makes sense – wonderful. Doubts, no, but even Millie is a human being and you can fail. Very, very good. Football is sometimes like this; now we got a penalty and we say we didn’t panic. I didn’t see us panic, that’s right – I liked how we reacted – but we needed a penalty for that situation. That doesn’t say we were sensational, the boys are human beings. I was sure we would not panic, we would not show the nerves you are all waiting for. We are long enough in this situation. We know it’s difficult for other teams to beat us, that always gives us the opportunity pretty much to win it. Most of the draws we had, we were closer to winning the game. That gives us confidence, that we know another chance will come – go for it and do the right things. We didn’t do the right things before; five or 10 minutes before the equaliser we had so many little mistakes that made it a wild game. We controlled the game completely and then we gave Fulham the ball, the crowd came and it was a bit more exciting again. We had a very intense week, going to Munich and coming back, travelling to London is not around the corner for us. So I’m completely fine – average game, sensational result. It’s the best position you can be in. For us, it was clear – it is always clear – City don’t look like they’ll drop a lot of points, so we have to win and to win and to win. That’s our job to do. They don’t play today, we knew that, but now they have a game in hand. That doesn’t mean we are now far away from them or something like this. It is very important that we won today; I think you could see it in our reaction after the game, we are really all very, very happy about it. The most important thing now is they all come back healthy again. For quite a lot of players they will come up against quite an intense time, two games for most of them and then we start immediately against Tottenham. An interesting game against a really good football team. Nothing is decided, all we can make sure is we stay in the race – and we want to stay in the race. Today we showed that, so all good. It’s after the international break. I don’t know exactly how many international players Fulham have that will have to go, but City have a lot, I’m pretty sure, so that’s then always a different game. Fulham play good football. The next step for them, Scott [Parker] will do it by himself, but it is to create something and [create] chances or whatever. It didn’t feel that we were properly under threat even when they had the ball, to be 100 per cent honest, but a lot of things are really good. This is my second game against Fulham – my first game at Fulham – it’s kind of the DNA of the club, I know how they got promoted last year and they’re really a football-playing side. There is so much potential here. What I liked today is they looked quite calm, they’ve kind of accepted a situation and now come on, let’s play football again. They worked so hard for it, a few more years so hard for it, to get into the Premier League. Now maybe it looks like next year they will not be there, but ‘now let’s enjoy it still’ – and that’s how it was. [It was] difficult to play against them, I have to say, really difficult. It’s Hendo. Hendo will go to the national team; two or three days at Melwood to do the rehab, but it looks positive. I think he is in contact with Gareth [Southgate] so when he can train in that moment, he will go to the national team. If he plays, Gareth will decide then, but it’s really positive. He was still not able to play today but it was not that serious – and now, in three or four days, he should be fine.